In early summer 1987, two beautiful eyes started popping out from posters in the streets of major cities in the USA asking to the public: Who’s That Girl? 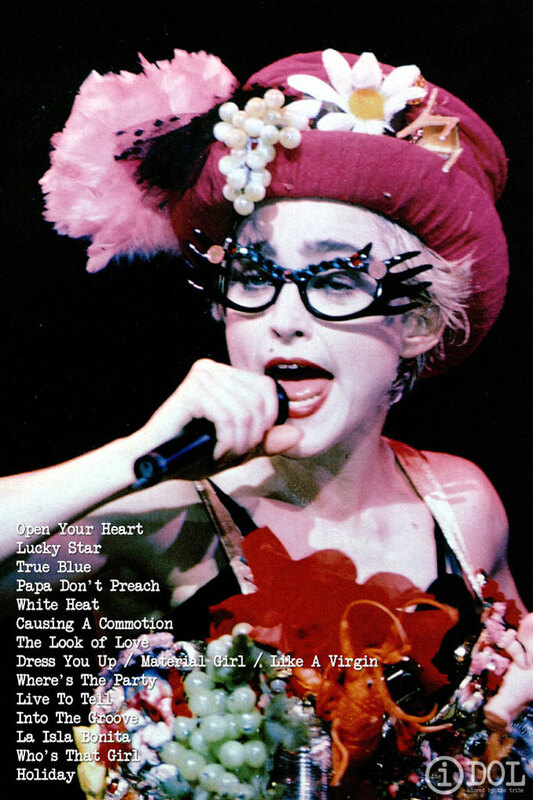 A few weeks later Madonna was on the road with her first world tour, the one that has consacrated her as the world’s leading female star of the ’80s. Madonna suprised the world with extravangant clothes and accessories and a selection of songs from her first three albums in a heartfelt show that was broadcasted worldwide live from Torino, Italy on September 4, a show that later combined with footage from the other Italian show in Florence and bits from Tokyo, became the famous VHS tour souvenir Ciao Italia. Madonna’s Madison Square Garden performance on July 13th 1987 raised over $400,000 for the American Foundation for AIDS Research, making her one of the first major star to have a big scale fundraiser event to support the fight against this disease. During this performance Madonna dedicated the beautiful ballad Live to Tell to her late friend Martin Burgoyne. Burgoyne, a friend since her early struggling days in New York, died of Aids in 1986. Background vocals on this tour were done by Donna De Lory, Niki Harris and Debra Parson. Donna and Niki worked with Madonna for the first time on this tour. The dancers were Shabba Doo, Angel Ferreira and Chris Finch, who was then 14 years old. The costumes of this tour were designed by Marlene Stewart that has worked many times with Madonna helping her to create her looks in many of her videos as well as in other tours. Stewart studied at the Fashion Institute of Technology in New York and later at the Los Angeles Fashion Institute. While working on her own clothing label called Covers, she met a young Madonna and helped her with costumes for her Virgin Tour. She created the original bustier for the “Open Your Heart” video, reprised for the opening number of the Who’s that girl tour. Today, Marlene Stewart has firmly established herself as one of the most successful costume designers in the entertainment industry. 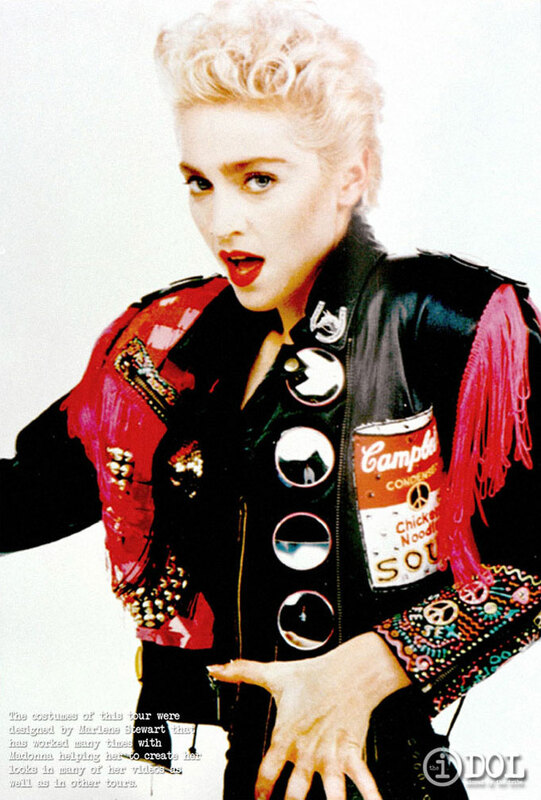 Herb Ritts did a amazing photographic photo session with Madonna wearing all her stage costumes of the Who’s that girl tour from the unfamous bustier to the nice Campbell Soup Jacket worn during the Into The Groove number. 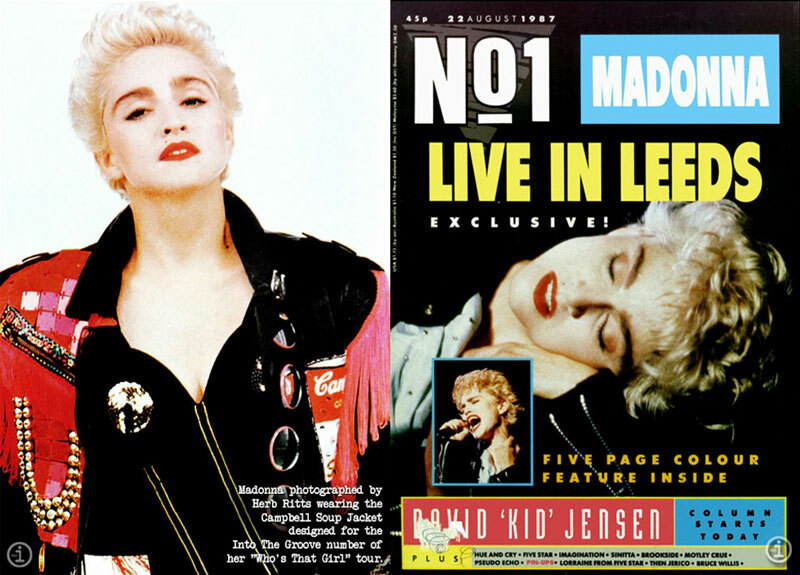 One of the leading Uk teen Magazines of the time, N°1, published a special tour report from the dates in England. Digging their interesting tidbits we discover that Madonna played to 296,000 people in Britain. 3 nights of 72,000 at Wembley, 80,000 good Yorkshire stock in Leeds. Tickets were £16 for Webmley and £15 at Leeds making £4,656,000 in all. Attempts to stop the Wembley shows by the local council failed. A code for punters has been set up, whereby “they must promise not to be rowdy and not to throw up in the gardens of solid Wembley burghers”. Among the thousands tour memories submitted to Madonna Tribe during the last few months there was one from this tour which was very special. MadonnaTribe reader Diesel6888 shared photos he took himself of a very approachable Madonna jogging. Be careful or you will fall and hurt yourself. 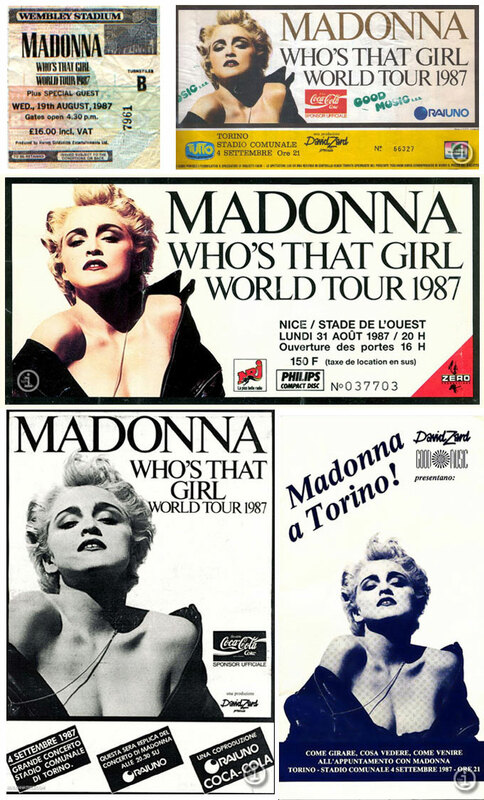 When Madonna closed her Who’s That Girl Tour in Italy, it became a national celebration. Tickets were immediatly sold out and to prevent huge masses of people moving to Torino or Florence from other parts of the country, Rai, the Italian national tv channel contacted Madonna to broadcast her first Italian concert live on television. Once the deal was made Rai staff arranged a meeting between Madonna and her long lost Italian relatives, that were traveled from their home town of Pacentro to Turin, to finally meet their hugely famous cousin few hours before the show. The Vitucci family posed with Madonna and her brother Christopher for the cameras while a very impressed Madonna noted how she and Giuseppe, the kid of the family, had the “same eyes”. During the show Madonna send her regards to Bambina her grandmother’s sister who could not travel to Torino because of her age to meet her famous relative. However the city of Turin was not taken by surprise by the thousands of people flocking from all over Italy and Europe. The city’s council prepared and distributed a special, custom made, map of the city with Madonna posing on it which is shown below.